Empty Vessels – Now Available! I’m delighted to announce that Empty Vessels is now available for purchase! A young man that sees monsters, the ghost that keeps him company, and the weird and haunted world of Others that he finds he needs to help protect. Possessed dolls, faceless ghosts, bone girls and horned boys, and things that go bump in the night. …this might be a book for you! For sites with non-US versions (Amazon, Kobo, iTunes) it should also be available on your local version. If you enjoy it, it would be wonderful if you could leave a nice rating and/or review on Goodreads! It absolutely does make a huge difference in helping other readers find it. Empty Vessels (m/m/m paranormal!) releases tomorrow! Now’s the last chance to get it at preorder prices! Preorder here before tomorrow’s release (Nov 21 at 7 pm EST) for 15% off! 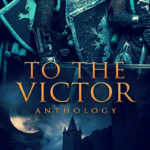 ONE WEEK until the release of the To The Victor anthology, which I’ve contributed a story to — a f/f story about a lady knight who faces down an extremely flirty dragon to try to rescue a princess. PREORDER NOW FOR 15% OFF! TWO WEEKS until the release of Empty Vessels, a m/m poly paranormal romance novel about a literally haunted young man who sees monsters hiding among humans–and, after years avoiding them, realizes he might be able to help them against a worse threat. PREORDER NOW FOR 15% OFF! I’m super happy to announce that Hair to the Throne has released! It’s Pandemonium book 3, following The Cobbler’s Soleless Son and Behind Bars. This one stars a young woman who, after twenty-five years of life in a tyrannically-ruled demonic city, gets spirited away to the Prince’s castle, where she encounters an old friend. And suddenly, it’s not one person against the world any more. Less Than Three Press ❤ Amazon ❤ Barnes & Noble ❤ Bookstrand ❤ Smashwords ❤ Kobo ❤ iTunes. For sites with non-US versions (Amazon, Kobo, iTunes) it should also be available on your local version. If you enjoy it, it would be wonderful if you could leave a nice rating and/or review on Goodreads! It really does make a huge difference in helping other readers find it. I’m so excited to announce the release of Behind Bars, a story set in the same world as the Cobbler’s Soleless Son, about a widower who hates demons having to work with one when his son ends up in danger. It’s part of Less Than Three Press’s My Dearest Enemy collection, so check it out if you’re in the mood for Enemies to Lovers! Less Than Three Press in ebook and in a print omnibus with Cobbler included ❤ Amazon in ebook and print , ❤ Barnes & Noble in ebook and print ❤ Bookstrand ❤ Smashwords ❤ Kobo ❤ iTunes. For sites with non-US versions (Amazon, Kobo, iTunes) it should also be available on your local version. If you enjoyed it, please consider leaving a nice rating and/or reviewing on Goodreads! I can’t possibly overstate how much it helps new readers find my books. Thanks, and I hope you have fun reading!